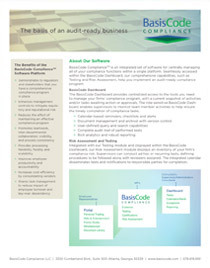 BasisCode Compliance (www.basiscode.com) is the industry’s most comprehensive software platform that improves compliance management for financial firms, compliance consultants, law firms and other service providers. The software simplifies and centralizes compliance management, ranging from compliance testing and risk assessment to trading surveillance, insider trading and staff certifications. The rules-based engine makes it easy for users to modify workflow logic throughout the compliance management lifecycle. “From the firm’s inception in 2000, our mission has been to serve as an extension of our clients’ compliance team and work side-by-side with them to ensure the highest quality of service and counsel. Our decision to partner with BasisCode Compliance was based on what we determined to be the most robust and functional platform out there backed by a solid service team. We reviewed a number of competitive compliance systems and chose the BasisCode platform because of its ability to more efficiently manage multiple relationships and enhance our productivity as well as of our clients,” said Marvin Barge, president and founder of Barge Consulting. Compliance departments and officers are facing greater scrutiny than ever before as the regulatory environment continues to evolve and becomes increasingly difficult to navigate. 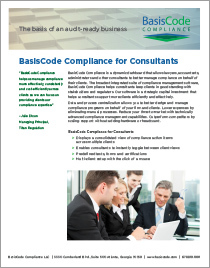 BasisCode Compliance centralizes the industry’s broadest range of functionality within a single platform, increasing compliance management processing visibility. The BasisCode Compliance dashboard displays a consolidated inventory of a firm’s program while the BasisCode Compliance portal engages consultants and supervisors, as well as non-supervisory staff, in maintaining a culture of compliance. Recently, BasisCode CEO, Carlos Guillen, moderated a webinar hosted by the National Society of Compliance Professionals (NSCP) which brought together leading compliance professionals and consultants who shared insights on how to best utilize compliance consultants. The expert panel explored issues regarding when to hire a third-party compliance consultant; what types of work can be done; how to evaluate consultants; and differences between a fully-outsourced consulting relationship versus project support. Here is a link to the webinar-on-demand: https://basiscode.com/news/when-to-hire-a-third-party-compliance-consultant-webinar/. Barge Consulting is a premier provider of SEC compliance consulting services for investment management firms and advisors under the Investment Advisor and Investment Company Acts of 1940. The firm specializes in the areas of mock SEC examinations, compliance program development, enterprise risk management and annual compliance reviews. As part of its services, Barge Consulting provides on-site consulting on the rules and regulations and industry best practices, training and AML reviews. The firm’s experienced professionals pride themselves in delivering practical, solutions-oriented assistance, and each service is customizable and tailored to each firm’s compliance needs. 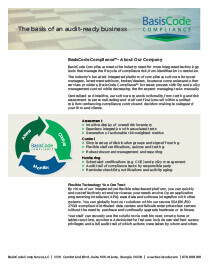 For more information, visit www.bargeconsulting.com.